Columbia Records (aka Columbia and written as COLUMBIA in capital letters) is an American record label owned by Sony Music Entertainment (SME). It was founded in 1887 after the American Graphophone Company closed its doors, which was the company that had replaced the Volta Graphophone Company a few years back. It is the oldest name in the music industry and was only the second company to start making recorded records. Columbia Records went on to release music by many notable singers, instrumental performers and bands. From 1961 to 1990, its music was released outside of the United States and Canada by the CBS Records label, before using the Columbia Records name worldwide starting in 1990. It is one of Sony Music's three most important record labels, along with RCA Records and Epic Records. Until 1989, Columbia Records had nothing to do with to Columbia Pictures, which had used different names for record labels that they owned including Colpix Records, Colgems Records, Bell Records and later Arista Records. Rather, as above, it actually worked with CBS (which stood for the Columbia Broadcasting System), a broadcasting media company and was co-founded in 1927 by Columbia Records itself, and bought the label in 1938. Although Arista Records was sold to BMG, Arista would later become a label that had started out much like Columbia Records, through its connection to Sony Music. Both Columbia Records and Columbia Pictures are now related to each other because of their ownership by Sony Corporation of America, the owner of both the music and motion picture companies of Sony in the United States. Artists that have signed to Columbia Records include Adele, A R Rahman, Barbra Streisand, Beyoncé, Bring Me the Horizon, Bruce Springsteen, Calvin Harris, Celine Dion, Daft Punk, David Gilmour, Earl Sweatshirt, Electric Light Orchestra, Ella Henderson, James Arthur, J. Cole, Juicy J, Little Mix, Madeon, MKTO, One Direction, Passion Pit, Pharrell Williams, Rachel Platten, the Neighbourhood, The Script, T.I., Train, the casts of Fox's hit TV shows Glee and Empire and others. In 2012, Columbia Records became the label that had the most music played on adult contemporary radio in the US, and was named the #1 adult contemporary label that year. The company was first founded in 1887 as the Columbia Phonograph Company by Edward Easton (who lived from 1856 to 1915) of New Jersey, and other people who had agreed to help provide money and resources for the company. Its name comes from the District of Columbia, where its headquarters used to be. At first it had a strong grip of the sales of Thomas Edison's phonographs and phonograph cylinders in Washington, D.C., Maryland and Delaware. Because it was a tradition of some of the other phonograph companies in the United States, Columbia started to make many cylinder recordings of its own, and its list of music in 1891 came to be about 10 pages long. Columbia broke up with Thomas Edison's phonograph company and the North American Phonograph Company, because the North American Phongraph Company split up in 1894. After that, Columbia started selling only its own kinds of records and phonographs that they had invented themselves. In 1902, Columbia introduced the "XP" record, a record made out of molded brown wax, so they could sell their leftover items. Then they introduced records made out of black wax in 1903. Tim Gracyk said that they continued to make brown wax records until 1904, and he said the last brown wax record that they sold was #32,601, which was a copy of "Heinie", a duet song by Arthur Collins and Byron G. Harlan. He also said the molded brown wax records may have been sold to Sears for them to sell instead, maybe under Sears' "Oxford" name for Columbia's products. Columbia started selling disc records and phonographs in addition to its cylinder system starting in 1901. 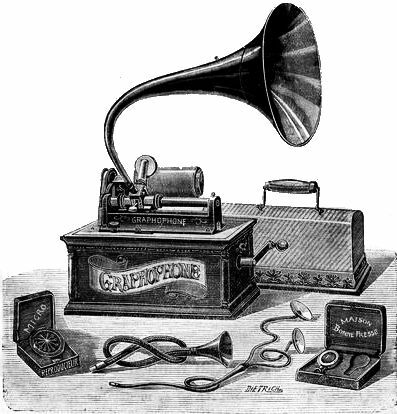 It took the place of the "Toy Graphophone" from 1899 which used small vertically cut records. For the next 10 years, Columbia competed with its rivals, the Edison Phonograph Company cylinder company and the Victor Talking Machine Company disc record company. It was a selling war between the top three names in American music at the time. Columbia called a number of New York Metropolitan Opera singers to make music to be sold be the label starting in 1903, so they could respect its line of artists more, which included Marcella Sembrich, Lillian Nordica, Antonio Scotti and Edouard de Reszke. But the technology they used to make their music wasn't thought by people to be as good as the technology that Victor, Edison, England's His Master's Voice of the Victor Talking Machine Company or Italy's Fonotipia Records had used with classical singers before World War II. After a failed attempt in 1904 to start making discs with the grooves of the record stamped onto both sides of each disc in 1908, Columbia successfully started mass production of what they called their "Double-Faced" discs; the 10-inch kind initially sold for ¢65 each. They also introduced the inside-horn "Grafonola" to compete with the extremely popular "Victrola" sold by Victor. During this time, Columbia used the "Magic Notes" logo, which was a pair of sixteenth notes (semiquavers) in a circle—both in the United States and worldwide, where this particular logo would never substantially change. Columbia stopped making wax cylinder records in 1908 in order to to start selling celluloid cylinder records that were made by the Indestructible Record Company of Albany, New York; they were sold as "Columbia Indestructible Records". In July 1912, Columbia decided to concentrate only on disc records, and stopped making and selling cylinder phonographs; they still kept selling Columbia Indestructible Records for a year or two. Columbia was then split into two companies: one that would make the records, and one that would make the record players. Columbia's phonograph company's headquarters were moved to Connecticut, and Ed Easton went with it, with said company eventually being renamed the Dictaphone Corporation. In late 1923, Columbia started being held by a receiver. The company was also bought by its division based in England, named the the Columbia Graphophone Company, in 1925. The label design, record numbering system and recording process were also changed. On February 25, 1925, Columbia began recording music with its new electric recording procedure that they had been given permission to perform on from Western Electric. 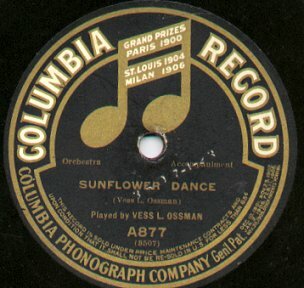 The new "Viva-tonal" records set a new standard in tone and clarity, which was unique on commercial discs during the 78 RPM era. The first electrical recordings were made by Art Gillham (aka the "Whispering Pianist"). In a secret agreement with Victor, the new recording technology was kept a secret for some months, in order not to hurt sales of their existing acoustically recorded catalog, while a new list of electrically recorded music was being put together. In 1926, Columbia acquired Okeh Records and its growing line of jazz and blues artists, including Louis Armstrong and Clarence Williams. Columbia had already built an impressive line of blues and jazz artists itself, which included Bessie Smith, in their highly successful 14000-D Race series. Columbia also had a very successful "Hillbilly" series (15000-D). In 1928, Paul Whiteman, the nation's most popular orchestra leader, left Victor to record for Columbia. That same year, Columbia executive Frank Buckley Walker pioneered some of the first country music or "hillbilly" genre recordings, with the Johnson City sessions in Tennessee, including artists such as Clarence Horton Greene and the legendary fiddler and entertainer "Fiddlin'" Charlie Bowman. He followed that up with a return to Tennessee the next year, as well as recording sessions in other cities in the South. In 1929, industry legend Ben Selvin signed on as house bandleader and artists and representatives (A&R) director. Other favorites in the Viva-tonal era included Ruth Etting, Paul Whiteman, Fletcher Henderson, Ipana Troubadours (a Sam Lanin group), Ben Selvin and Ted Lewis. Columbia kept using acoustic recording for "budget label" pop records well into 1929, on the labels Harmony, Velvet Tone (both all-purpose labels) and Diva (sold exclusively at W.T. Grant stores). 1929 was the year that Columbia's older rival and former affiliate Edison Records folded, leaving Columbia as the oldest surviving record label. In 1931, the British company Columbia Graphophone merged with the Gramophone Company to form Electric & Musical Industries Ltd. (EMI). Columbia Graphophone was originally a part of the US Columbia Records, but then went independent and purchased US Columbia in late 1929. EMI was forced to sell its US Columbia operations to the Grigsby-Grunow Company, makers of the Majestic Radio, because of anti-trust concerns. An abortive attempt in 1932 (made around the same time that Victor was experimenting with its 33 1/3 "program transcriptions") was the "Longer Playing Record", a finer-grooved 10-inch 78 RPM record with 4:30 to 5:00 playing time per side. Columbia issued about eight of these in the 18000-D series, as well as a short-lived series of double-grooved "Longer Playing Record"s on its Harmony, Clarion and Velvet Tone labels. All of these experiments were discontinued by mid 1932. A longer-lived marketing ploy was the Columbia "Royal Blue Record", a brilliant blue laminated product with a matching label. Royal Blue issues made from late 1932 to 1935 are particularly popular with collectors because of their rarity and musical interest. The C.P. MacGregor Company, an independent recording studio in Oakland, California, made Columbia's pressings for sale in West of the Rockies, and continued using the Royal Blue material for these until about mid 1936. It was also used for their own radio only music library. As the Great Depression's economic grasp tightened on the country in a day when the phonograph itself had become a passé luxury, nothing slowed down Columbia's decline. But it was still producing some of the most remarkable records of the day, especially on recording sessions that were produced by John Hammond and financed by EMI for overseas release. Grigsby-Grunow went bankrupt in 1934 and was forced to sell Columbia for a mere $70,000 to the American Record Corporation. This already included Brunswick Records as its premium label, so Columbia was relegated to slower sellers such as the Hawaiian music of Andy Iona, the Irving Mills stable of artists and songs and the still unknown Benny Goodman. By late 1936, pop releases were discontinued, leaving the label basically out of business. In 1935, Herbert M. Greenspon, an 18-year-old shipping clerk, led a committee to organize the first trade union shop at the company's main manufacturing factory in Bridgeport, Connecticut. Elected as president of the Congress of Industrial Unions, Greenspon negotiated the first contract between factory workers and Columbia's management. In a career with Columbia that lasted 30 years, Greenspon retired after getting the position of executive vice president of the company. The former Columbia factory in Bridgeport (which closed in 1964) has been converted into an apartment building called Columbia Towers. As southern gospel developed, Columbia had tried to record music for the artists associated with that genre. For example, Columbia was the only company to record music by Charles Davis Tillman. Luckily for Columbia in its Depression Era financial woes in 1936, the company entered into an exclusive recording contract with the Chuck Wagon Gang, a relationship which continued into the 1970s. A signature group of southern gospel, the Chuck Wagon Gang became Columbia's bestsellers, with at least 37 million records sold, many of them being shown through the Mull Singing Convention of the Air sponsored on radio and later television by southern gospel broadcaster J. Bazzel Mull. In 1938, ARC and the US Columbia label were bought by William S. Paley of the Columbia Broadcasting System for $750,000. Columbia had originally founded CBS in 1927 along with New York talent agent Arthur Judson, but soon cashed out of the partnership. Paley had later acquired the radio network in 1928. CBS revived the Columbia label in place of Brunswick, and the Okeh label in place of Vocalion Records. CBS renamed the company as Columbia Recording Corporation and retained control of all of ARC's past master recordings. But in a complicated move, the rights to the pre-1931 Brunswick and Vocalion masters, as well as trademarks of Brunswick and Vocalion, reverted to Warner Bros. (who had leased their whole recording operation to ARC in early 1932) and Warners sold the lot to Decca Records in 1941. In 1947, CBS founded its Mexican record company, Discos Columbia de Mexico. 1948 also saw the first classical LP Nathan Milstein's recording of the Mendelssohn Violin Concerto. 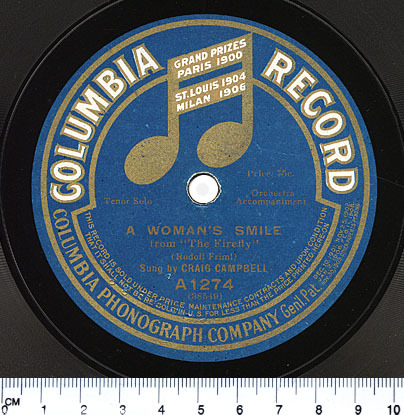 Columbia's 33 rpm format quickly spelled the death of the classical 78 rpm record and for the first time gave Columbia a commanding lead over RCA Victor Red Seal. Columbia's president Edward Wallerstein, instrumental in steering Paley to the ARC purchase, at this time set his talents to the goal (as he saw it) of hearing an entire movement of a symphony on one side of an album. Ward Botsford writing for the Twenty-Fifth Anniversary Issue of High Fidelity Magazine relates, "He was no inventor—he was simply a man who seized an idea whose time was ripe and begged, ordered, and cajoled a thousand men into bringing into being the now accepted medium of the record business." Despite Wallerstein's stormy tenure, in 1948 Columbia introduced the Long Playing "microgroove" LP record format (sometimes written "Lp" in early advertisements), which rotated at 33⅓ revolutions per minute, to be the standard for the gramophone record for half a century. CBS research director Dr. Peter Goldmark played a managerial role in the collaborative effort, but Wallerstein credits engineer William Savory with the technical prowess that brought the long-playing disc to the public. By the early 1940s, Columbia had been experimenting with higher fidelity recordings, as well as longer masters, which paved the way for the successful release of the LPs in 1948. One such record that helped set a new standard for music listeners was the 10" LP reissue of The Voice of Frank Sinatra, originally released on March 4, 1946 as an album of four 78 rpm records, which was the first pop album issued in the new LP format. Sinatra was arguably Columbia's hottest commodity and his artistic vision combined with the direction Columbia were taking the medium of music, both popular and classic, were well suited. The Voice of Frank Sinatra was also considered to be the first genuine concept album. Since the term "LP" has come to refer to the 12 inch 33 1⁄3 rpm vinyl disk, the first LP is the Mendelssohn Violin Concerto in E minor played by Nathan Milstein with Bruno Walter conducting the New York Philharmonic (then called the Philharmonic-Symphony Orchestra of New York), Columbia ML 4001, found in the Columbia Record Catalog for 1949, published in July 1948. The other "LP's" listed in the catalog were in the 10 inch format starting with ML 2001 for the light classics, CL 6001 for popular songs and JL 8001 for children's records. The Library of Congress (Washington DC) now holds the Columbia Records Paperwork Archive which shows the Label order for ML 4001 being written on March 1, 1948. One can infer that Columbia was pressing the first LPs for distribution to their dealers for at least 3 months prior to the introduction of the LP in June 1948. The catalog numbering system has had minor changes ever since. Columbia's LPs were particularly well-suited to classical music's longer pieces, so some of the early albums featured such artists as Eugene Ormandy and the Philadelphia Orchestra, Bruno Walter and the New York Philharmonic Orchestra, and Sir Thomas Beecham and the Royal Philharmonic Orchestra. The success of these recordings eventually persuaded Capitol Records to begin releasing LPs in 1949. RCA Victor began releasing LPs in 1950, quickly followed by other major American labels. Decca Records in the U.K. was the first to release LPs in Europe, beginning in 1949. Many album covers put together by Columbia and the other major labels were put together using one piece of cardboard (folded in half) and two paper "slicks," one for the front and one for the back. The front slick bended around the top, bottom, and left sides (the right side is open for the record to be inserted into the cover) and glued the two halves of cardboard together at the top and bottom. The back slick is pasted over the edges of the pasted-on front slick to make it appear that the album cover is one continuous piece. In 1951, Columbia USA began issuing records in the 45 rpm format RCA had introduced two years earlier. Also in 1951, Ted Wallerstein retired as Columbia Records chairman; also, Columbia USA severed its decades-long distribution arrangement with EMI and signed a distribution deal with Philips Records to market Columbia recordings outside North America. EMI continued to distribute Okeh and later Epic label recordings until 1968. EMI also continued to distribute Columbia recordings in Australia and New Zealand. American Columbia was not happy with EMI's reluctance to introduce long playing records. Columbia became the most successful non-rock record company in the 1950s when it lured impresario Mitch Miller away from the Mercury label (Columbia remained largely uninterested in the teenage rock market until the early 1960s, despite a handful of crossover hits). Miller quickly signed on Mercury's biggest artist at the time, Frankie Laine, and discovered several of the decade's biggest recording stars including Tony Bennett, Jimmy Boyd, Guy Mitchell, Johnnie Ray, The Four Lads, Rosemary Clooney, Ray Conniff and Johnny Mathis. He also oversaw many of the early singles of the label's top female recording star of the decade, Doris Day. In 1953, Columbia formed a new subsidiary label Epic Records. 1954 saw Columbia end its distribution arrangement with Sparton Records and form Columbia Records of Canada. Despite favoring a country music genre, Columbia bid $15,000 for Elvis Presley's contract from Sun Records in 1955. Miller made no secret of the fact that he was not a fan of rock music and was saved from having to deal with it when Presley's manager, Colonel Tom Parker, turned down their offer (Presley ended up signing with Columbia's now-sister label RCA Victor). However, Columbia did sign two Sun artists in 1958: Johnny Cash and Carl Perkins. With 1954, Columbia USA decisively broke with its past when it introduced its new, modernist-style "Walking Eye" logo, designed by Columbia's art director S. Neil Fujita. This logo actually depicts a stylus (the legs) on a record (the eye); however, the "eye" also subtly refers to CBS's main business in television, and that division's iconic Eye logo. Columbia continued to use the "notes and mike" logo on record labels and even used a promo label showing both logos until the "notes and mike" was phased out (along with the 78 in the US) in 1958. 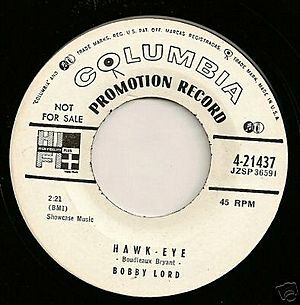 In Canada, Columbia 78s were pressed with the "Walking Eye" logo in 1958. The original Walking Eye was tall and solid; it was modified in 1961 to the familiar one still used today (pictured on this page), despite the fact that the Walking Eye was not used during most of the 1990s. In 1956, Columbia jazz producer George Avakian signed Miles Davis to the label. In 1958, Davis's sextet released Milestones, an influential album which explored the techniques of modal jazz. In 1959, Davis's sextet released Kind of Blue, an album which has remained extremely popular and influential. In 2003, it appeared as number 12 in Rolling Stone's list of the "500 Greatest Albums Of All Time". Columbia Records Facts for Kids. Kiddle Encyclopedia.